In the Spirit of The Four Davids, Michael has continued Mixing Mediums—the Mediums of Sculpture and Painting. Similar to The Four Davids, he is utilizing a Famous Statue and a Historical Painting Style for inspiration. In this instance, the Statue of Liberty and Fernand Léger's painting Woman with a book from 1923. 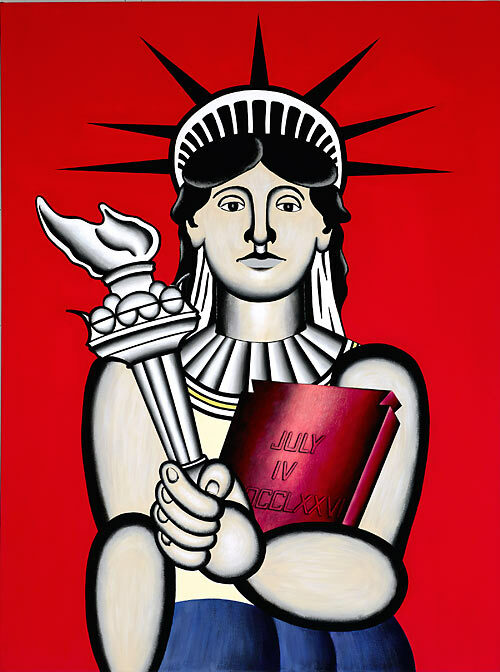 Michael researched extensively while working on this painting—visiting MoMA to study the Léger painting and of course, the Statue of Liberty- both located in his hometown, New York City. Statue of Liberty 1923 is being offered as a giclée on canvas print, with a limited production of 195 signed and numbered prints. The canvas measures 18" x 24".